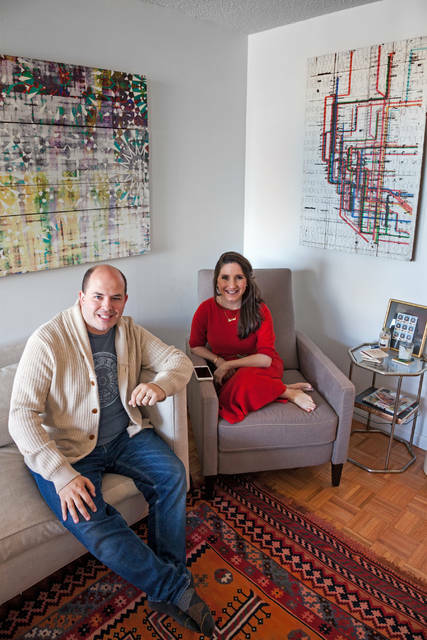 The facts: A photo of CNN chief media correspondent Brian Stelter and his wife, Jamie, sitting in their apartment next to a table with a pipe bomb package similar to those sent to high-profile targets in recent days is false. Stelter told The Associated Press on Thursday that the photo circulating on social media was doctored to add the package. The original photo appeared as part of a feature about the couple’s Manhattan apartment by 6sqft , a New York architecture news site. It ran on Jan. 16. “This is despicable,” Stelter said. “It was photoshopped.” Time Warner Center in Manhattan was evacuated Wednesday after CNN received one of the pipe bombs. It was addressed to former CIA director John Brennan, a frequent critic of President Donald Trump. Authorities have intercepted several pipe bomb packages this week, including ones sent to Hillary Clinton, former President Barack Obama, actor Robert De Niro and liberal philanthropist George Soros. The facts: A set of three photos of injured federal police officers in Mexico were not taken after confrontations with migrants making their way in a caravan from Central America to the U.S., as suggested on posts circulating on social media. In the most prominent photo, an officer is bleeding from a head wound. Gustavo Aguado Butanda, a local photographer in the Mexican state of Michoacan, told The Associated Press that he took the photo on Oct. 15, 2012, in Tiripetio. Butanda said that police had entered a school in the town during a clash involving “normalistas,” a group of students protesting modernization of curriculums. 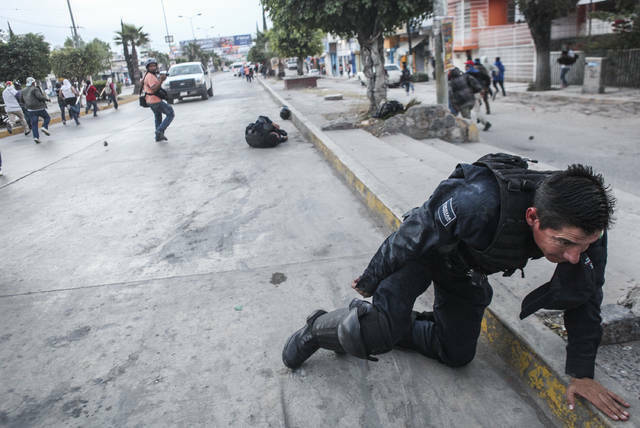 In another photo, an officer attempts to pull himself up onto a sidewalk after being injured in a clash with protesters in Chilpancingo, a city in the state of Guerrero, ahead of a concert scheduled for that night. Cristopher Rogel Blanquet, who took the photo in December of 2014, said the concert was to honor 43 students who went missing that year. In the third photo, a police officer is bleeding from his nose amid a group of other officers in riot gear. 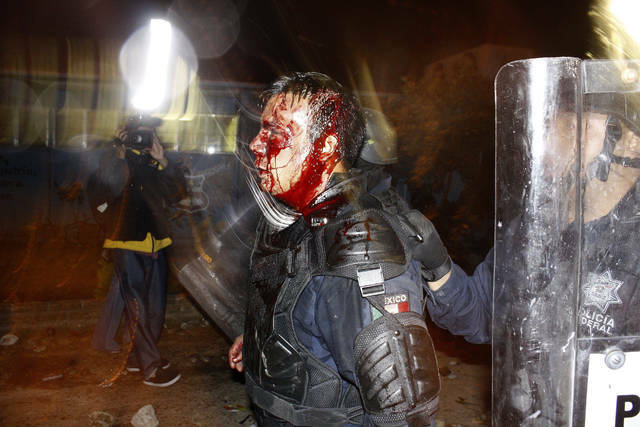 Associated Press photographer Luis Alberto Cruz was present during the confrontation on Feb. 15, 2011. Cruz said the officer was injured in a clash with teachers in Oaxaca, Mexico. The facts: A photo showing a crowd of nearly one million people engulfing major roadways was not taken during President Trump’s rally in Houston this week, as several people falsely claimed on social media. The president stopped in Houston Monday to stump for Republican Sen. Ted Cruz, as part of his multi-stop tour to mobilize GOP voters ahead of the midterm elections. Trump held the event at the 19,000-seat Toyota Center, where crowds gathered outside hours prior to his speech. But the image circulating on social media was snapped in June 2016 during a million-person parade that took place in downtown Cleveland to celebrate the Cavaliers’ NBA championship. Using a drone, Bruce Bishop and Matt Mishak took the photo while covering the event for the Chronicle-Telegram, a newspaper in Elyria, Ohio.